Whatever Happened to Plain Old Red? Children have the uncanny ability to state simple truths in the plainest of terms. One Sunday a month I volunteer in my church as an assistant in Alpha Theater, a program that teaches kindergarteners through second graders about adult worship service. In this class the children learn the Lord’s Prayer, the Doxology, respectful behavior, and other things that make up adult worship in God’s house. There is music, an offering plate, and a story-lesson similar to a sermon. Then the children have a quiet activity reinforcing a point being addressed in the story. Often the activity is a coloring sheet. One morning, the story was from Luke eight, where Jesus calms the waters of the storm when His disciples are afraid. I gathered the coloring sheets and the box of crayons my group would need. Then I spread out the mat and arranged our materials. As the children came in for the activity, I handed them their papers and talked about the story. While studying the picture of the disciples in a small boat being tossed across the angry waves, I felt a tug on my sleeve. “Could you help me find red?” asked a cheery-faced little girl. “Of course,” I said as I rummaged through the assortment of loose crayons in the box. She looked at the color, turned the crayon to its side and read, “Cranberry.” Then she shook her head. Eventually we found a “plain old red” crayon, and content with the familiar shade, she returned to her coloring. Later as I rode home from church, I realized how much I empathized with her feelings. How many times do I go to buy a particular item, only to find it’s been changed or discontinued? Frequently it has been moved to another area in the store, so I end up roaming the aisles looking for it, many times giving up in exasperation and having to seek help. In a world where we are overwhelmed with choices and confronted with an ever-changing line of products, isn’t it comforting that God never moves, changes, or disappears? “Every good and perfect gift is from above, coming down from the Father of the heavenly lights, who does not change like shifting shadows” (James 1:17 NIV). We don’t have to guess where God is today, try out a new model of Him, or worry that He’ll desert us. The God that Jesus taught about long ago by the sea is the same God today, wherever we are. He calms our unrest in a turbulent world, just as He did that night of the storm. Janice Alonso is a writer from Alpharetta, Georgia. When our family moved to follow my husband’s career, we judged which church God wanted us to attend, in part by the friendliness or unfriendliness of the congregation. Was God’s love shining through the people, or not? Did they show hospitality? After a number of such rebuffs, I felt not only foolish, but also more and more reluctant to extend a welcome. Why don’t they greet me if I’ve spoken to them before? I thought. Why should I always be the one to take the initiative? One Sunday morning after the church service, as I stood in line to shake hands with our pastor, I felt compelled to introduce myself to the middle-aged woman behind me. No, she’ll just say we’ve met before! I thought. I’m tired of feeling foolish. Nonetheless, it seemed urgent that I greet her, and it was “now or never,” because the line of people waiting to speak with the pastor was growing short. Soon she’d be gone. To my astonishment, tears burst to her eyes. “You’ll be amazed at what you’ve just done,” she said. I swallowed hard and barely recovered in time to get her name and present her to the pastor. That afternoon I telephoned her to see if she had special needs. Like most of us, she needed love. Nowadays I greet people who appear to be newcomers, no matter whether I’m sometimes rebuffed or not. I pray for God’s love to shine through me, and I try not to mind if sometimes I appear foolish for Him. Elaine Schulte is the author of 36 novels and hundreds of articles and short stories. She and her husband live in Tucson, AZ. I was not a perfect child, not the child every parent dreams of raising. In fact, I remember clearly a recess discussion with my second-grade friends about how to best show ultimate disrespect to adults such as parents. We developed the following three-step hierarchy:. Stick out your tongue, then turn around and wiggle your backside. Stick out your tongue, turn around, lift up your skirt, and wiggle your backside. This dates me, but when I was in second grade, girls wore dresses most of the time. Being a bit of a daydreamer, I wasn’t listening when some savvy kid reminded us to execute these steps only when adults weren’t watching. Big mistake. Shortly after our recess pow-wow, my father and I had a little disagreement about what I was to wear to Brownie Scouts. He wanted me to take off my school tights, which had a big hole in the knee, and put on my new pair. I protested, knowing the evil pair lurking in my dresser lived up to their name, being plenty tight for my chubby frame. Dreading the effort needed to wiggle my way into their elastic prison, I tried whining and crying my way out of Dad’s directive. He wouldn’t budge, so I launched the big guns, straight into Step 3, sticking out my tongue, lifting my skirt and wiggling my exposed, well-padded backside with panache. Then I walked out the door. I needed to get to Brownie Scouts. Dad couldn’t chase me in his wheelchair, so I considered myself safe until I realized he would tell Mom. Once she knew, my Christmas wish for a Brownie Beanie was toast, and a well-deserved spanking inevitable. I knew I was in for it and dragged myself home after our meeting. While my act of disobedience resulted in painful consequences, not once did I wonder whether my dad still loved me or cared for me. Not once did I think I was so bad, maybe he’ll disown me. He was my dad, and when I was born, he and Mom promised to care for me, no matter what I did. I trusted in their promise and felt secure. When God saves us, He promises that we are part of His family, no matter what. When as Christians we sin, a little voice often whispers to us, “You’re not part of God’s family anymore. God’s children don’t ever, ever sin.” When we listen to that voice, we become discouraged. We question our salvation, but what we need to do is trust the promise of God. We are His no matter what, because Jesus, our brother, paid in full the price for our sins. We may have consequences to face because of our actions—damaged relationships, lost opportunities, painful circumstances—but God does not disown us. Smarting from our hurts, we loosen our tongues and cry, “I’m sorry, Dad,” because we are certain of who He is. Jolene Philo is a freelance writer and the author of A Different Dream for My Child: Meditations for Critically and Chronically Ill Children and Different Dream Parenting: A Practical Guide to Raising a Child with Special Needs. You can learn more about her ministry at www.jolenephilo.com. Midyear Musings is the topic of this issue for good reason. At the beginning of the year, many people take inventory of their lives and make New Year’s resolutions. However, the hustle and bustle of the holiday season is not the best time to reevaluate our priorities, activities, friendships, and spiritual lives. During the summer (or midwinter for our friends in the Southern Hemisphere), life seems a bit simpler, and we often have more time to think about life, love, God, and the implications of the choices we’ve made and our hopes for the future. So take some time out each week in the next few months and muse. Think about God’s goodness and His plan for your life. Consider where you’ve been and where you’re going. Dream a little, or dream a lot, and then pray about how you might fulfill those dreams. Rest in the knowledge that God loves you more than you can possibly imagine, and He has an incredible plan for your life. Read God’s Word. Stop. Look. Listen. And choose to take joy and peace, instead of stress and strife. Some friends visiting in our home volunteered to show us colored slides of places they had visited in their travels. One particular picture proved to be impressive. Its indescribable beauty held us spellbound. The tree-covered mountains graced the center of the spectacular picture. A blanket of snow wrapped the tips of some of the highly elevated trees. The sky, a perfect blue, displayed scattered puffs of white clouds. The lake, as smooth as glass, mirrored a duplication of the scene above it. Everything blended in perfect harmony as the picture covered the screen. Our four-year-old daughter was as enthralled as we were. Excitedly she proclaimed, “Oh look, Mommy. The sky is in the water.” She was right. It was difficult to delineate where the actual ended and the reflection began. Such a perfect blending could only be done by the Master’s touch. God’s divine intention is that we will be so much like Him that people will be able to see His characteristics revealed in our lives. This likeness is impossible for us to achieve on our own. Only God can perform that feat in us through His grace. In order for Him to make us like Himself, we need to cooperate by becoming intimately familiar with the Original through our relationship with Him and through Jesus’ example. Just as Christ manifests His love, compassion, and forgiveness to us, He expects us to extend these same gifts to others by patterning our lives after His. The beautiful blending of Christ in our lives, with His reflection being displayed through us, can only become a reality with the Master’s touch as we abide in Him and He in us. Grayce L. Weibley is a retired writer from Lecanto, Florida. The town is fragile; it mustn’t be touched. I can crush and destroy any building. And wreak havoc in the model town. Adam Graham writes with his wife in Boise, Idaho. And give to God each moment as it flies. I live in pleasure when I live to Thee. 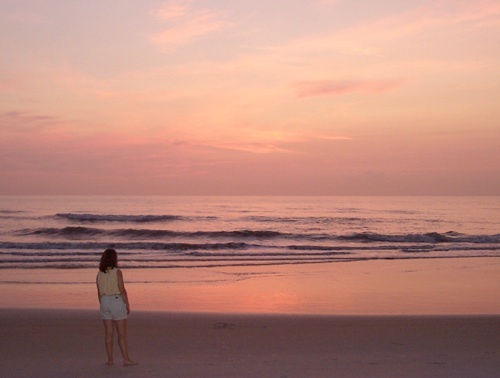 As the sun rises over the ocean, a young woman ponders her past, present, and future. As we consider our lives, it is good to remember that God knows us intimately, wherever we go and whatever we do, even from before we were born (Psalm 139). Our lives and our futures are safe in His hands. Return to Barefoot Path main page.